Clear Creek was retained by the City of Phoenix (City) to perform environmental due diligence work for the potential acquisition of a 12-acre parcel of land previously occupied by an agricultural cooperative from the mid-1950s to approximately 1999. The business provided services to local farmers and included the formulation and distribution of various pesticide mixtures. Although previous investigations and remediation completed by the cooperative resulted in a no further action (NFA) determination and deed restriction with the Arizona Department of Environmental Quality (ADEQ), the City was concerned about residual pesticide levels potentially remaining at the property and the potential liability to the City as an owner. Toxaphene, a currently banned organochlorine pesticide (OC pesticide), was the primary chemical of concern (COC). Clear Creek performed a Phase I ESA according to ASTM standard and conducted an extensive review of numerous environmental documents and investigations previously conducted for the property to formulate an opinion on the appropriateness of previous work including site characterization, remediation activities, and risk-based closure that supported the deed restriction and NFA determination. As a result of the document review, additional investigation activities were completed including development of a Conceptual Site Model (CSM) and additional sampling to fill data gaps created by a fraction of existing data that was deemed unusable according to EPA data usability guidance documents. Site maps of existing usable data were imported to GIS software, ArcView, and digitized to generate NAD 83 coordinates which were appended to the additional surveyed sampling points for a single usable contaminant database. Results of additional sampling identified significant additional toxaphene contamination above the original cleanup goals as well as other COC’s, contrary to the contents of the NFA determination. 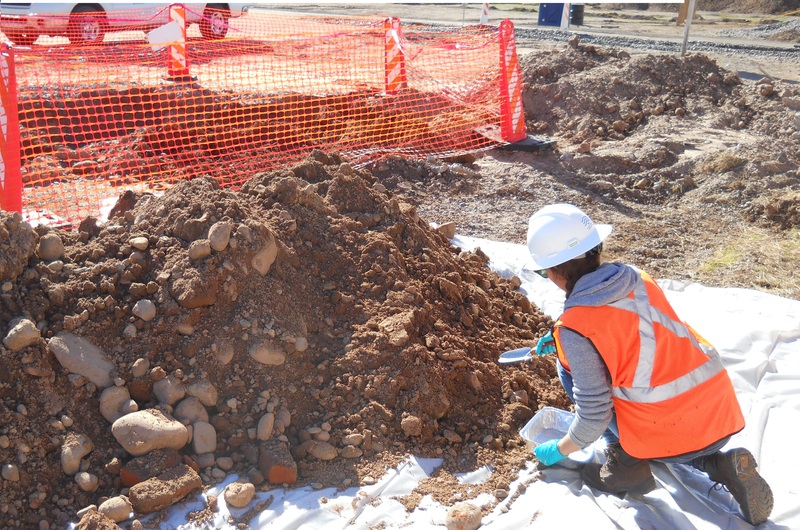 Using the characterization data in the contaminant database, Clear Creek developed a vertical distribution profile model, calculated excavation volume estimates, and estimated costs to achieve incremental cleanup goals by excavation and offsite disposal. This information was used by the City to understand potential financial liabilities and to assist with negotiation of a sale price with the property owner. After the City agreed to the assignment of a pollution liability insurance policy from the previous property owner and acquired the property, Clear Creek was retained to develop and oversee a remediation program including a human health risk assessment (HHRA) that was conducted in coordination with the ADEQ Voluntary Remediation Program (VRP). Project deliverables included a Remediation Work Plan, Sampling and Analysis Plan, Quality Assurance Project Plan, and an Excavation Plan. Remediation work was initiated in December 2012 and was completed in February 2013. Excavated soils, concrete, and asphalt were tested and segregated for disposal based on RCRA waste determinations. In addition to the excavation of impacted soils, the remediation work included the demolition and removal of remaining infrastructure including underground utility lines, power poles and substation, and a septic system. Throughout the project, decontamination, dust, and stormwater controls were implemented to prevent the migration of contaminants off the property. Nearly 8,000 tons of soils and concrete were hauled offsite for disposal. Approximately 15% of that waste was RCRA hazardous waste by toxicity characteristic. The City recorded a new deed restriction for the property and received a new NFA determination from the ADEQ VRP in December 2013. Costs for remediation of OC pesticides were approved by the insurance company.